Published June 9th, 2007	in Misc. Revered by housewives, loathed by neutered pets, Bob Barker is an American institution. He has been hosting the day time tv game show The Price is Right long enough to make it the longest running show of its kind. Of course, many belive that CBS replaced him with an animatronic robot sometime in the 80’s. But it is undisputed that the Price is Right is a very important part of getting over a cold. It has been scientifically proven (look it up). Rest coupled with lots of liquids isn’t anything if you don’t have reruns of the Price is Right to watch. …and everything also has a value. But they are rarely the same. Each day market forces determine the price for a myriad number of securities. Of course, you have to respect price. It is the net aggregate result of millions of minds and billions of dollars. But at the same time, you have to keep in mind that value is a totally different thing. Just because IBM is priced at $100/share doesn’t mean it is worth $100/share. There is but one simple rule: if you go over the retail price, you lose. The same can be applied in the market. Overpay and you’ll be sorry. On the otherhand, pay what the asset is worth or pay less (if you’re really good) and you’re sitting pretty. Refer to Rule #1 - buy when the worth is more than the price. All during the show, the studio audience participates rather loudly. They yell and scream at the contestants, telling them what do do. In the market, the same roar of the crowd can be heard. But it is unwise to defer to it because the crowd can get too emotional. In fact, if you are an astute observer you can watch for extremes of crowd psychology and zig when they zag. It is extremely difficult, but thinking for yourself is rewarding. 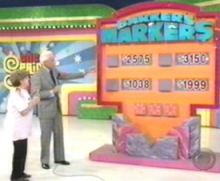 The Price is Right has models - known as “Barker’s Beauties” - who drape themselves over the products. The equivalent would be glossy annual reports, chiclet-toothed CEOs giving confident speeches, or foaming at the mouth while blaming short sellers for the company’s woes, off balance sheet financing and any other gimmick thrown at you by insiders. A lot of the mini-games in the show involve probabilities. The more a contestant understands this and the more they apply it, the higher their chance of winning. The same can be said about the market. Nothing is known as 100% fact or can be taken as gospel. Everything is “probable”. Your job is to figure out how probable and how much you would win/lose one way or the other. Easy to overlook but actually it is vital. If a contestant dawdles or can’t think fast enough, they lose. In the market it is the same. To take advantage of opportunities you have to be both vigilant and agile. As Gordon Gekko, famously put it, “Greed, for lack of a better word, is good.” The Price is Right has been a shining beacon of greed and conspicuous consumption. The same underlying ethos powers the market. Of course, sometimes it flips to its polar opposite: fear. But without the motivation of greed, where would we be? The show was first aired in 1956 but since 1976 it has had the same format and host. Why change a good thing? In the same way, when you have a strategy that works in the market, just keep doing it. Until it doesn’t. Simple, right? But few can actually stick to their knitting. It is more challenging than it appears. If you watch enough reruns, you can easily catch the people who have no real clue about the game. They haven’t really studied it, they haven’t familiarized themselves with all the mini-games and some just don’t really want to be there. In the market, some participants have no clue what is really going on, a few have some inkling while others may even think they have a right to make money. Or that just following the crowd will be reward enough. Soon enough they learn a rather painful lesson. Its not worth much if you’re not having fun! What a great posting! Trading should not be more complicated than a TV game show (a lesson I’m still learning). I think you should expand this into one of those financial self-help books (think ‘Little Book that Beats the Market’). You could retire on the royalties. thanks for the compliment and the book idea. Crazier books have seen print!